Although World War I began in 1914, the United States did not join the war until 1917. The impact of the United States joining the war was significant. The additional firepower, resources, and soldiers of the U.S. helped to tip the balance of the war in favor of the Allies. When war broke out in 1914, the United States had a policy of neutrality. Many people in the U.S. saw the war as a dispute between "old world" powers that had nothing to do with them. Also, public opinion on the war was often split as there were many immigrants who had ties to both sides. When the Germans sank the Lusitania in 1915, a passenger ocean liner with 159 Americans on board, the public opinion in the United States toward the war began to change. This act killed 1,198 innocent passengers. When the United States finally entered the war two years later, the cry "Remember the Lusitania" was used on recruitment posters and to unite the people against the Germans. In January of 1917, the British intercepted and decoded a secret telegram sent from German Foreign Secretary Arthur Zimmerman to the German ambassador in Mexico. He proposed that Mexico ally with Germany against the United States. He promised them the territories of Texas, New Mexico, and Arizona. The Zimmerman Telegram was the final straw. President Woodrow Wilson gave a speech to Congress on April 2, 1917 asking for them to declare war on Germany. In his speech he said that the U.S. would go to war to "fight for the ultimate peace of the world." On April 6, 1917 the U.S. officially declared war on Germany. The U.S. army in Europe was under the command of General John J. Pershing. At first, the U.S. had few trained troops to send over to Europe. However, the army was quickly built up through the draft and volunteers. By the end of the war around 2 million U.S. troops were in France. The U.S. troops arrived just in time to turn the tide of the war in favor of the Allies. Both sides were exhausted and running out of soldiers. The influx of fresh troops helped to boost the morale of the Allies and played a major role in the defeat of the Germans. After entering the war, President Wilson issued his famous Fourteen Points. These points were his plans for peace and the goals of the United States in entering the war. Wilson was the only leader to publicly state his war aims. Included in Wilson's Fourteen Points was the establishment of a League of Nations that he hoped would help to end war in the future. After Germany was defeated, President Wilson pushed for his Fourteen Points to be followed by the rest of Europe and the Allies. Wilson wanted all of Europe to be able to recover quickly from the war, including Germany. France and Britain disagreed and placed harsh reparations on Germany in the Treaty of Versailles. The United States did not sign the Treaty of Versailles, but established their own peace treaty with Germany. 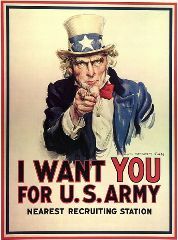 The United States had 4,355,000 military personnel involved in World War I. It suffered 322,000 casualties including 116,000 soldiers that were killed. The United States didn't become an official member of the Allies, but called itself an "associated power". The U.S. Navy played a major role in helping to blockade Germany, keeping out supplies and hurting Germany economically. The U.S. forces that were sent to Europe during World War I were called the American Expeditionary Forces (AEF). The nickname for U.S. soldiers during the war was "doughboy."